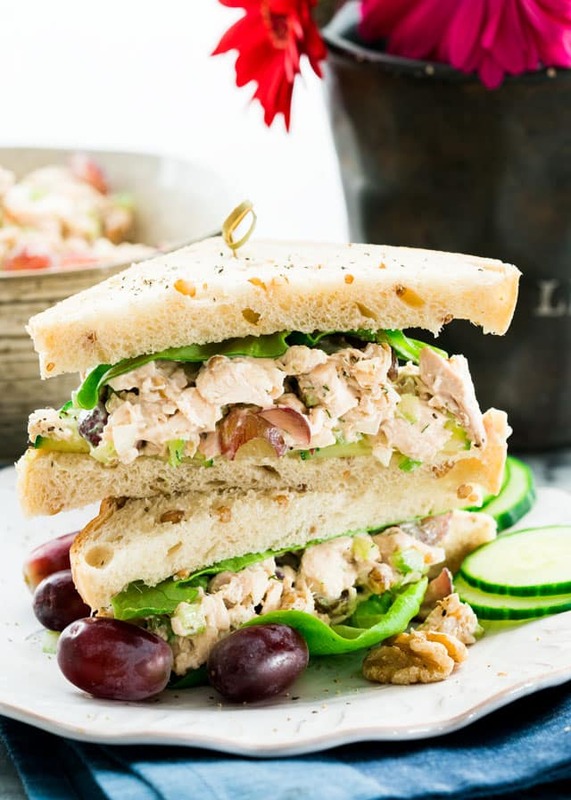 These Knockout Chicken Salad Sandwiches will turn your lunch from boring to spectacular! They’re packed with flavor and really quick and easy to make. Let’s talk chicken salad sandwiches, shall we? Don’t they make the best lunches? I certainly think so and they really are one of my favorites because not only are they delicious but they are super quick and so easy to put together. This particular chicken salad however is to die for, not that I’m biased or anything. It’s crunchy because it has chopped walnuts and it’s a bit sweet from grapes. I think adding these two ingredients to a traditional chicken salad, totally turns this salad into a star. It’s perfect for when you’re in a rush and need to pack a lunch, it’s also perfect for dinner when you don’t feel like cooking. It’s also great because I like to make a big batch of this salad, and I’m literally eating chicken salad sandwiches for the rest of the week for lunch because it will last up to 5 days in the fridge. 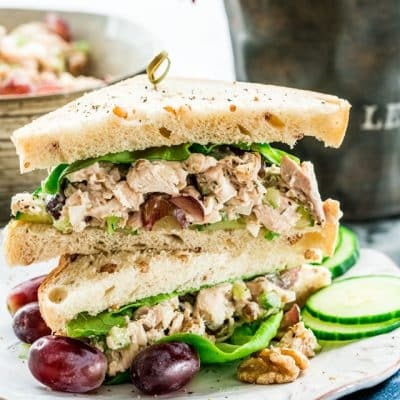 Eat this chicken salad on its own, or if you love your carbs like I do, serve it on your favorite bread, sometimes I serve it on croissants, sometimes in a wrap and sometimes with some nice and toasted bread. Whichever way you decide, this sandwich is the bomb! 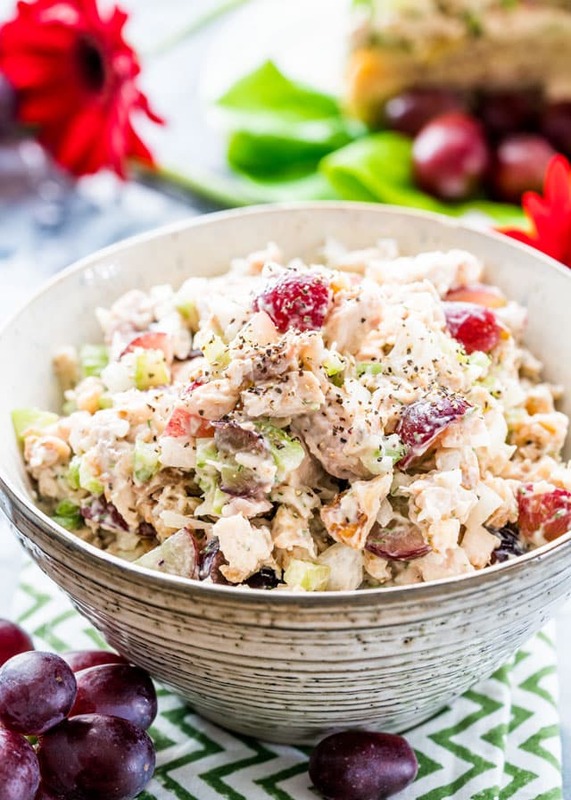 Check out some of my other tasty and easy chicken salad recipes! 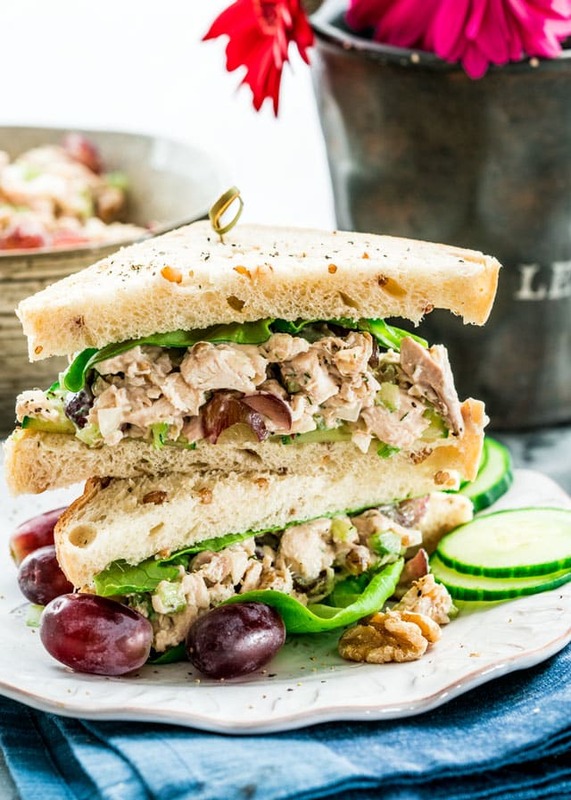 These Knockout Chicken Salad Sandwiches will turn your lunch from boring to spectacular! They're packed with flavor and really quick and easy to make. In a medium size bowl combine all ingredients together. Toast bread if desired, then spread the salad on bread, top with other veggies such as cucumbers, tomatoes or lettuce and serve. If you want to cut back on calories, use greek yogurt in place of mayo. I used whole grain bread for this recipe. Feel free to use whichever your favorite type is. Refrigerate leftovers in an airtight container in the fridge for 3 to 5 days. Recipe originally shared July 2012. This recipe is ah-mazing! Absolutely delicious! I’m making it again tonight for lunches tomorrow – if the fam doesn’t eat it all in the process! This was delicious!! Best chicken salad I’ve ever had. We used an avocado oil-based mayo because we’re dairy and soy-free and the salad was spectacular. I loved the sweetness of the grapes combined with the tartness of the onion, mustard, and Worcestershire. I may do less onion next time but this recipe will be a repeat in our house! I’m so glad you like it, we make this often for lunch, it’s one of our favorites as well. This truly was a knockout! I didn’t have grapes, so subbed in 1/2 cup chopped canned pineapple and 1 Tbsp craisins. All else followed exactly, flavors were perfectly balanced, nothing overpowered. I use Blue Plate mayo, the best IMO if you can find it – very mild and almost a whipped consistency. Never liked mayo in anything until I discovered this brand. So glad you liked this, Kelly! Making this today! What kind of bread do you use? It was a whole grain wheat bread, really good! This was super yummy! I just substituted for fresh dill and added dried cherries (couldn’t find cranberries). I tried this and it was delish. What can I use instead of mayo next time? Trying to find a healthier alternative. You could use greek yogurt or there are vegan alternatives like “veganaise” you could use as well. I can’t find any dill where Iive? What can I use instead? Hi. You don’t butter the bread? I love chicken and love this chicken salad so much! My hubby and kids loved it!! Looking at your pictures…at the top of my head : PICNICS! This sandwich recipe looks so yummy and filling. The pecans are a total knockout. A newlybaked loaf bread will make a really good pair for this. Yum! Your unique and interesting features have always impressed us. Now that we are getting a new look…Myfudo is moving to a new domain http://www.yumgoggle.com This has been a project we have been working on for almost a year now. We just launched our new gallery submission site, and we are just thrilled. We’d love you to join the latest virtual shindig that is all about photography, food, recipes, and culinary trends. We look forward to seeing your wonderful pictures, as always. Thanks! Love this chicken salad recipe. It’s just the way I like mine! Oh. My. Goodness. This was so good! I’m throwing out my go-to chicken salad recipe. We had this on croissants and it was a wonderful supper on a hot summer evening. Thank you! You’re welcome Kelli. Glad you liked it, you’re right, it’s perfect for summer.